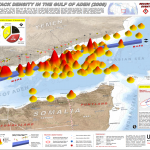 Recent events in the waters off the Somali coast are probably a sign of things to come. Pirates there have been a serious problem for many years (although historically dwarfed by the waters near Indonesia or even Nigeria), and the modern Navy has tended to only intervene and respond to civilian vessels after a mayday. This means that the Pirates are essentially taking the opportunity to attack highly vulnerable and ill-prepared victims. The main difference between pirates and terrorists seems to be that the latter is motivated by some political mission, whereas the former are just hoping to increase their wealth by force (motivated by greed). When we heard about the cruise ship that was hit with an a RPG, but managed to repel the attackers with a loud noise, we were led to believe there were just pirates afoot (and not internationally funded criminal syndicates with a political agenda). While that’s likely, one has to wonder at what (economic) point does the market for pirates give way to the politics of terrorists? Al Qaeda, of course, has been rumored to be discussing the use of vessels, including large fuel tankers, at sea in the same fashion as they had used airplanes on 9/11. Makes sense that they would discuss any vehicle under the sun given the nature of suicide bombing and the need to rapidly and discreetly “insert” themselves into a civilian zone. Therefore, if the threat of pirates increases far enough and ships remain vulnerable, eventually terrorists will make the glaringly obvious connection. The question then becomes whether countermeasures will be able to detect and prevent sufficient numbers of attacks to catch all those that might be linked to terror motives, and whether the root cause should/can be addressed rather than the symptoms. “Thwart terrorist activity and other lawlessness” is exactly what I am talking about. 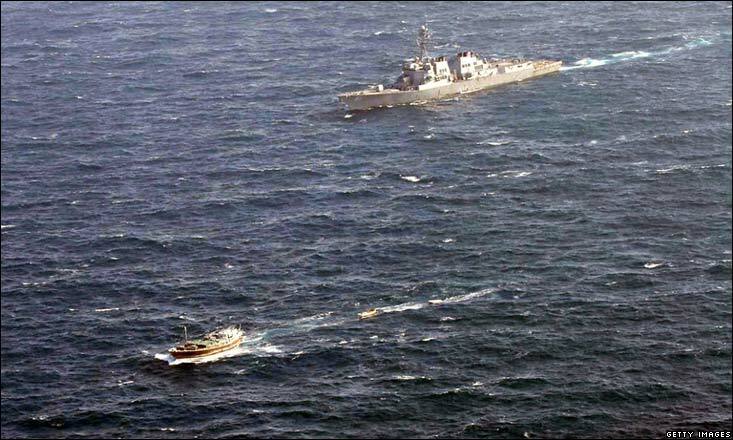 Does this mean the US Navy is now set to enforce the law in International waters? And do they need to mention multinational forces and the Iraq war in order to justify enforcing the law? The article also mentions “The Navy said it captured the dhow in response to a report from the International Maritime Bureau in Kuala Lumpur on Friday…” but it remains to be seen why this pirate ship in particular was of interest to the US Navy and why this is making mainstream news. Beyond the threats of lawlessness, we still must face the general issue of vulnerability of ships. Although I’ve seen some improvements, I have to say that things like electrified fences have serious draw-backs. Aside from falling into one yourself, it is a single control point and rather prone to failure (electricity is not plentiful or reliable at sea) as well as somewhat easy to work around (attackers might just move on to the next vessel, but if they are everywhere what would stop them from just developing insulation/shorting equipment?). While naval engineering has made great strides in making boats more seaworthy, this has not translated into innovation in private boating anti-piracy measures. When you think of the boating industry in general, do consumers want to spend money on teak fittings, extra shipping capacity, or surveillance cameras and ammunition? Thus, I think the best answer today actually is a reduction in threats, which means that (multi)national forces will have to find ways to cooperatively police the International waterways before the path of the pirates is joined by terrorists. I hate to say it, but it reminds me of the “great Naval powers”…what would Admiral Nelson do?